As the weather gets warmer, here's how to keep your kids safe when playing at the pool. There’s no doubt that play is important for kids, more so for their development. Spring is finally here and it is during this time of the year that children want to go outside to explore their environment and bask in the sunshine. Parents should be encouraging this. A change in season somehow manages to put a smile on people’s faces. With this lovely season comes sunshine and happiness! What better time is there to appreciate the beautiful weather besides in the pool with the kids? Children can have fun playing in the water but great precautions must be taken to ensure their water experience is enjoyable. • Sun protection – make sure your child wears a hat and that you regularly apply sunscreen. The latter should be re-applied even when they are wet. 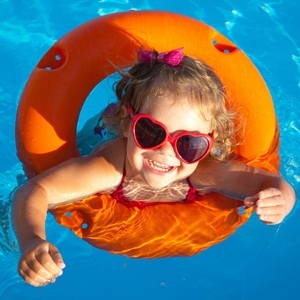 • Touch supervision - always be at an arm’s reach when swimming with an infant and toddler. • Clothing sizes - When buying a life vest, it’s important to make sure that it’s well-fitting. • Drink fluids – encourage the kids to drink fluids especially water to avoid dehydration in the heat. • Temperature - always check the temperature of the water to ensure that it’s suitable for both you and the child. • Safety barriers - Install a safety barrier around your swimming pool (either a fence or a wall). It should be high enough so the child cannot climb over. The doorway should have a self-locking mechanism and there may be no gaps greater than 100mm. • Clean up - Don’t leave your child’s toys in or around the pool to avoid children being tempted to retrieve them. The children’s paddling pools should be left empty when not in use. • CPR training - Anyone who watches a young child around a pool should learn CPR and be able to rescue a child if needed. Young children and even newborns can occasionally turn over or move around, so once again it has to be stressed that a child should never be left unmonitored especially if they are close to water. How do you keep your child safe from drowning? What are your strict summertime rules for staying safe?